At first these seemed like an irreconcilable collections of desires, but after many sleepless nights and fruitless Google searches, I came up with a solution. At the time I didn’t really understand the difference between, say, upgrading my blog to a custom domain and registering a domain directly through GoDaddy or the like. If pressed, I might have likened my choice to renting a room that’s already been decorated: someone’s already figured out how to make it nice, and for a small fee I can call it my own. I thought registering through GoDaddy would give me an empty warehouse space, and I’d have to learn how to build walls, and plumb it, and paint and whatnot before I could get on to the important business of inviting people over– i.e. using my website to market myself as a young professional. I still don’t understand all the implications of using a WordPress upgrade as a means of planting my flag in a chunk of cyberspace. I think I’ve found a small clue in the WordPress Domain Upgrade “Important Notes” section: I don’t have FTP access to your files. Could that be part of the mystery? Can I finish the next set of challenges with only a custom-domain blog, or will I have to do something more complicated? Do I “have a domain name that can be used to further explore DNS?” I’ll answer those questions soon, I’m sure. For now, all I have to do is understand DNS. For my fourth School of Webcraft challenge, I looked for HTML-like things in a walk around the block. I came up with the idea for this video quickly, because I felt it conveyed what my thought patterns were like post-HTML-lesson, suddenly seeing things in terms of tags. My bi-weekly dessert quest, transformed! It’s been a while since I’ve worked with video editing software at all, so I probably spent more time fiddling with that than I did learning the basic HTML tags. This is also the first thing I’ve shot in stop motion, which was easier to do than I expected, but also harder to do well, particularly on a public street where you don’t want to be the creep with a camera. Where’s my Google Glass already? Under the cut are my explanations for my choice of tags/object pairs and some credits from the video. 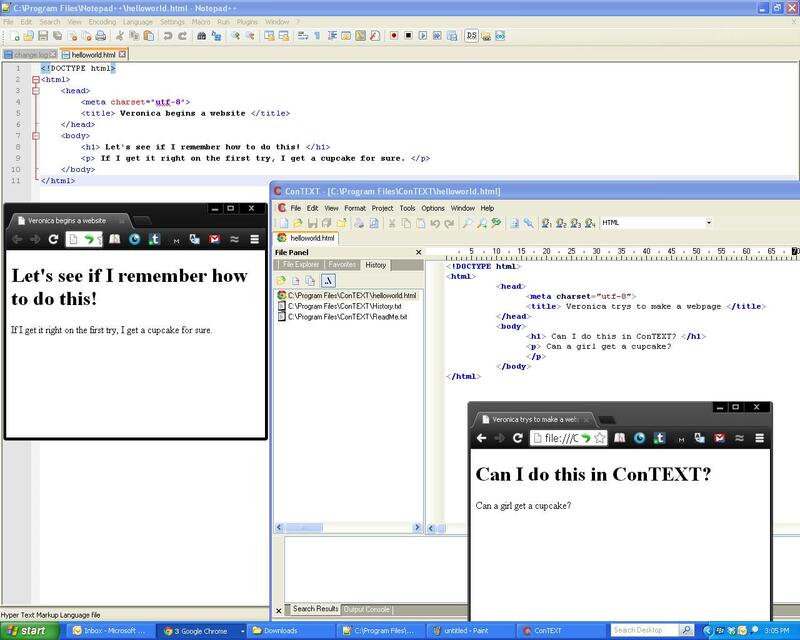 For the third School of Webcraft challenge I was tasked with choosing a text editor. After a brief consultation with the remarkable tables in the Wikipedia article on the subject, I downloaded both Notepad++ and ConTEXT. 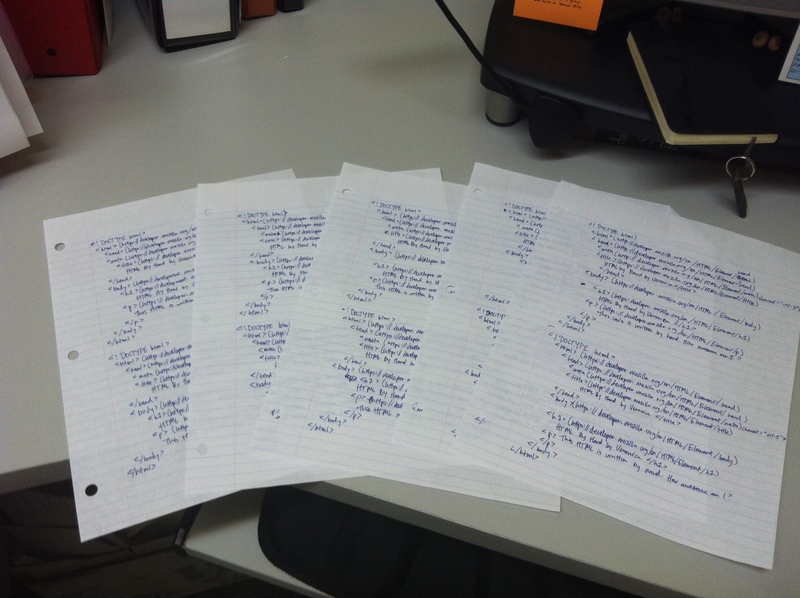 After typing out a couple little html documents — from memory, thanks repetitive writing exercise! — I ran both in Chrome. I may have been a little preoccupied by cupcakes. Below are the highlights of my observations about text editors. Keep in mind these are all provisional observations. If you’re more experienced with these programs, you might want to interject “well, that can all be changed in settings!” or “of course it does that, why wouldn’t it!” but I’m bringing the gift of ignorance here. I want to see how intuitive the programs are, how quickly I can figure out how to do stuff without looking it up. This is a main advantage of Notepad++ according to Wikipedia. I can’t yet imagine personally having such a big chunk of code that I need to hide parts of it, but it does seem useful generally. On the whole, i decided to stick with Notepad++, at least for now. After reading through other students’ comments, I realized I wanted the option of a Live Preview. It’s been exciting to move beyond the What You See Is What You Get* kind of website creation that, say, WordPress usually provides me, but it was tedious to resave and reload my html document each time I wanted to see how I was changing things. After a bit of quick searching, I found this Preview HTML plug-in that provides exactly that for Notepad++. It seems to work quite well. All told, not bad for someone who started out thinking that “text editor” was synonymous with “word processor.” I rewarded myself with a delightful cupcake from Pushkin’s bakery. Mmm, learning is tasty. 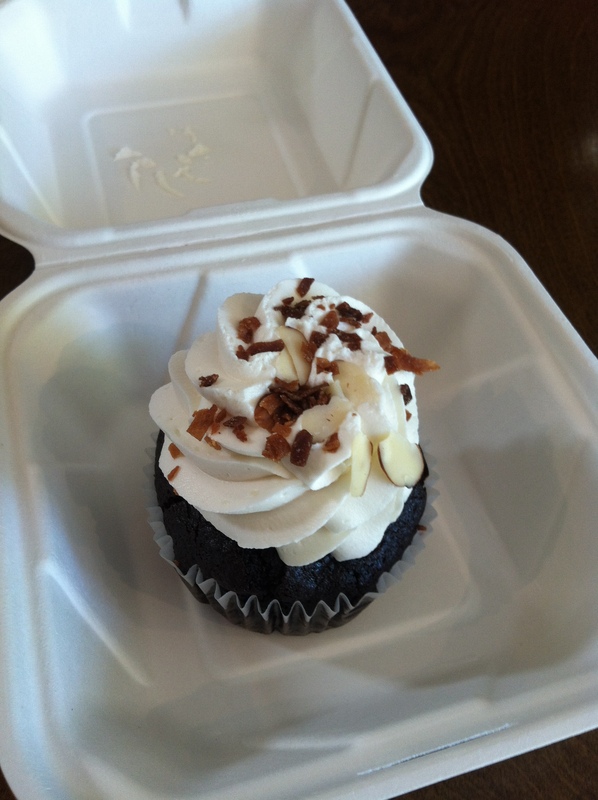 Don’t worry, I did get my cupcake. * All-knowing Wikipedia says the acronym WYSIWYG is pronounced whizzy-e-wig. Really? Per the second challenge in the P2PU School of Webcraft Webmaking 101 course, I spent about 15 minutes today copying some basic HTML by rote. I haven’t used repetitive writing as a mnemonic in a long time, and I was surprised at how effective it was. I’ve also been thinking about the efficacy of writing (although not necessarily writing any more) thanks to this blog post titled “How to Stop Reading and Start *Doing*” over at Barking Up The Wrong Tree. Spoiler alert: the answer is write more. Astute observers may notice I went a little above and beyond in my HTML by Hand assignment. I printed the text to copy on my way out the door last night, so that I could do my writing without the temptation of the internet. I failed to notice that what was printed wasn’t exactly what was on the screen. Apparently Chrome (or perhaps the P2PU website?) takes the liberty of adding the destination of a hyperlinked piece of anchor text in parenthesis after the anchor text. * I can totally see this being a feature rather than a bug in most cases, since you lose a lot of information when you print a document that includes a lot of hyperlinks. On the other hand, I ended up copying out the addresses of link the lesson includes to give learners more information about certain web elements. but I thought there might be some pedagogical end to justify the means, and so diligently copied all the very similar URLs over and over. I suppose the exercise and later realization did make me think about the loss of information that happens when moving from the web to hard copy. I think In my perfect world, hyperlinks would be added as footnotes or endnotes when a webpage was printed, but including them as parentheticals works pretty well too. One last thought: i really enjoy the way indentation works to make code legible, and I wish I’d taken the time to use different colors for each tag. *I’m still new to this terminology, please feel free to offer corrections or clarifying edits. 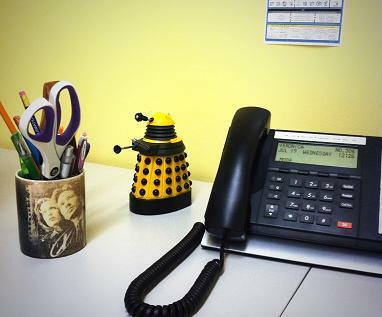 I was recently nominated by a coworker to become our office’s crazy technology lady. It turns out there’s only so many times you can try to explain steampunk or your desk dalek, or nod understandingly when another office’s crazy technology guy mentions breadcrumbs, or expect other people to have seen “that one TED talk about gamification.” Eventually you’ve just painted yourself into a crazy corner. Luckily once you’re there, you get to wear cool glasses frames and everyone takes your word for it when you try to explain the ethos behind open source software. I don’t feel like I deserve to join the ranks of crazy technology people. Sure, I read Boing Boing over my lunch break, but the last time I spent any time working with HTML was probably to make my Myspace profile even more of a crime against design. Despite my enthusiastic start, I haven’t gotten very far on CodeAcademy. The only reason I know anything about the Moodle platform I may be using at work is long dinner conversations with Karla, a close friend, teacher and early adopter. But I do want to become a crazy technology lady. To me it’s simple: I value being a good citizen in meatspace, so I should value being a good citizen in the Metaverse. To me, that means learning as much as you can about what’s out there, contributing to it, and sharing the results. 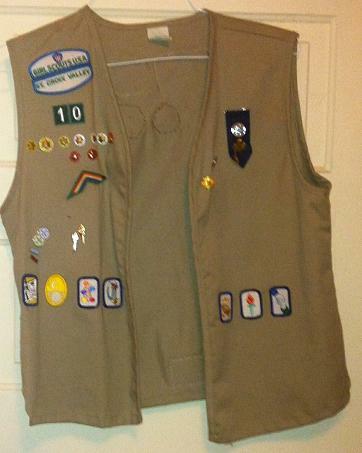 This is my Cadette Girl Scout vest. Trust me, the Junior one was more impressive. To that end, I want to learn more about how to better create meaningful web content. I discovered the Webmaking 101 course in the process of learning more about badges, with the goal of becoming a badge issuer for a program I staff called the Boards and Commissions Leadership Institute. I really enjoy earning badges of any kind: stars on a chore chart, badges on my Girl Scout vest, lesson badges on Duolingo. So of course I got sidetracked from badges in theory by figuring out how to earn a new kind of badge in practice, and here I am, writing a blog post to complete the first challenge. I’ve got my Badge Backpack on, and I’m ready for the next adventure.